A new, independent library is seeking to celebrate and preserve the heritage of St. Paul’s East Side – its working-class roots, its rich diversity and its fighting spirit. But first, organizers must preserve and restore a 98-year-old architectural landmark, from the roof to the ground floor. The East Side Freedom Library is the new name of the Beaux-arts style building located at 1105 Greenbrier St., site of the Arlington Hills Branch until last March. 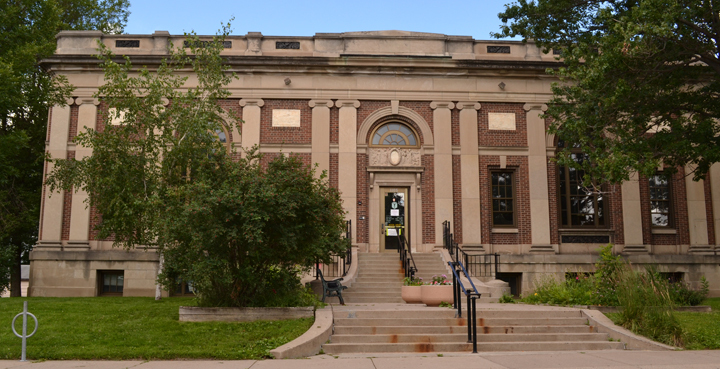 The Carnegie library’s name – and vision – changed after the City of St. Paul agreed to lease the space to Peter Rachleff and Beth Cleary, East Siders for the last 15 years. Rachleff, a labor historian and retired Macalester professor, says it’s impossible to talk about the East Side’s identity – past or present – without talking about labor. The East Side was once the home of several large, industrial employers like 3M and the Hamm’s brewery, and the neighborhood continues to attract immigrant families drawn by the promise of employment. 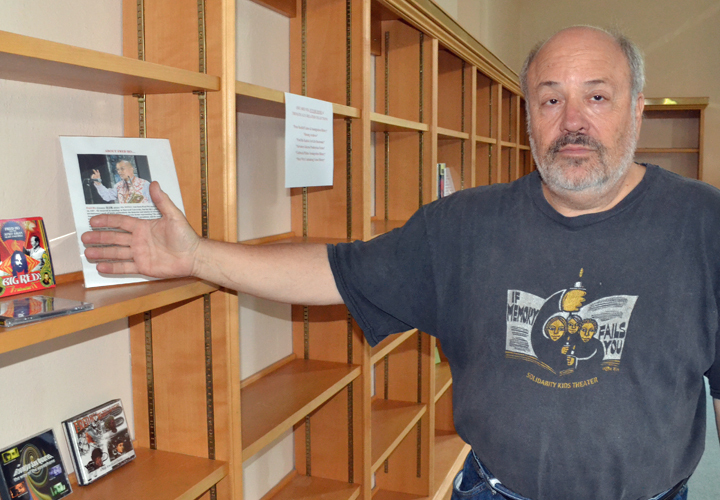 The shelves are mostly empty now, but Peter Rachleff hopes to move collections into the East Side Freedom Library by September, after replacing the building’s roof. Storytelling will be central to the East Side Freedom Library’s approach to exploring and preserving the East Side’s identity, Rachleff said. Naturally, that means books, about 20,000 of which the library will house. The collection will be focused in scope, with topics like labor history, immigration and African American history. Visual art and other materials – including, potentially, the Hmong Archives, a 20-year-old collection of textiles, story cloths, musical instruments and more – will enhance the collection. But collecting stories will be equally important to the East Side Freedom Library’s mission, Rachleff said. Rachleff and Cleary envision using the new library as a hub for collecting oral history interviews with East Siders, and as a forum for public programming that uses those interviews, from panel discussions to poetry readings. For the last 16 years, Rachleff has been part of the planning committee behind Untold Stories, the Friends of the St. Paul Public Library’s annual series of labor-related events. Before the East Side Freedom Library can begin installing its collections, though, Rachleff and Cleary must replace the building’s roof – and they must do it by year’s end, according to the terms of their $1-per-year lease with the city. An online crowdfunding campaign to “Raise the Roof” drew $22,000 in donations, which will help the library draw matching funds from St. Paul’s Neighborhood STAR Program for capital improvements. Rachleff is optimistic the library will be open – with a new roof – by September, but he said the total cost of restoring, preserving and renovating the facility could reach $1 million over the next five years. “The pace at which we are able to do things with the building will be dictated by the pace at which we are able to raise money,” he said. Already, a number of labor and progressive activists, union leaders and East Siders have stepped up to support the new library financially and to be part of the planning process. Madsen is particularly excited about the library’s interest in preserving the industrial heritage of the East Side. Several of her family members worked at the 3M plant. Bobby Kasper, president of the St. Paul Regional Labor Federation, pledged support for the project, and he called on area unions to consider getting involved as well. Support from unions, Rachleff acknowledged, will be critical to the East Side Freedom Library’s mission. I love the idea of preserving and restoring older buildings. There’s something nice about remembering the heritage of your town. I hope them the best in their restoration project!